The MMDA has received a lot of flak from motorists and road safety experts regarding traffic schemes in Metro Manila This is but natural and one can say that “it comes with the territory,” considering that the agency handles much of the traffic management in MM and a lot of criticisms are actually of the nitpicking kind. Some matters, however, while appearing at first to be minor are actually details that should not be missed particularly if the end result may mean a matter of life or death. Details pertaining to the U-turn slots, for example, are often lost in the big picture approach of looking at the facilities as solutions to problems of congestion. In striving for faster speeds, the case for safety is often overlooked. In striving for continuous flow, the case for disciplined movement at intersections is discarded. And in imposing the scheme along roads not designed for it, the case for sound, safe design is sacrificed. The latter is demonstrated in the case of barriers used to delineate the U-turns, allocating space for turning vehicles while constricting that which is for others. For the barriers to be practically immovable, these were cast in concrete and painted to enhance visibility. In certain cases, reflectors were added to further increase visibility particularly at night-time. Previously, many barriers were made of plastic and filled with water for them to have weight. These eventually gave way to the more durable concrete barriers, although both were of the same shape and size and occupied significant space when laid out. 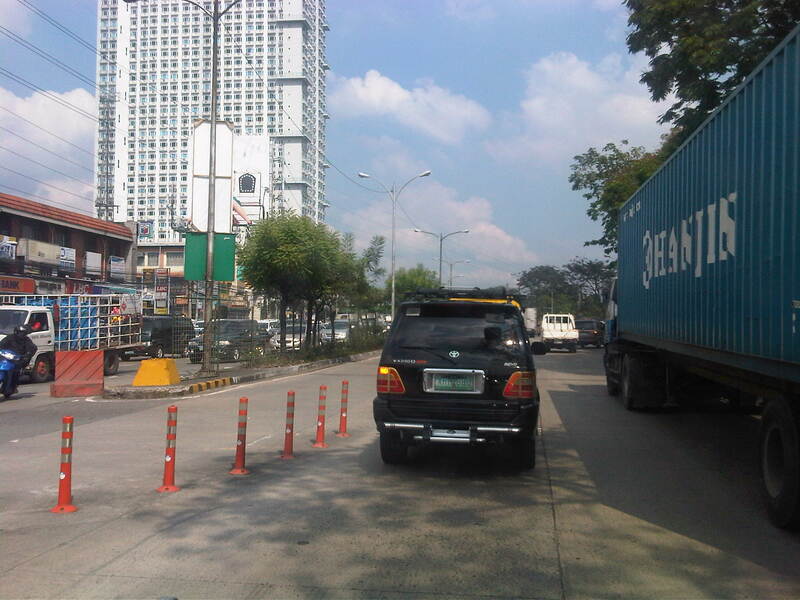 Recently, the MMDA installed plastic bollards at several U-turn slots, replacing the concrete barriers there. This was a welcome development that allowed the freeing up of space occupied by the massive concrete barriers. Moreover, while delineating the U-turns, the bollards will be more forgiving for motorists who could be involved in crashes involving these. Concrete barriers are not so forgiving and may cause a vehicle to overturn if not stop abruptly and highly likely to be causing serious injuries if not death. 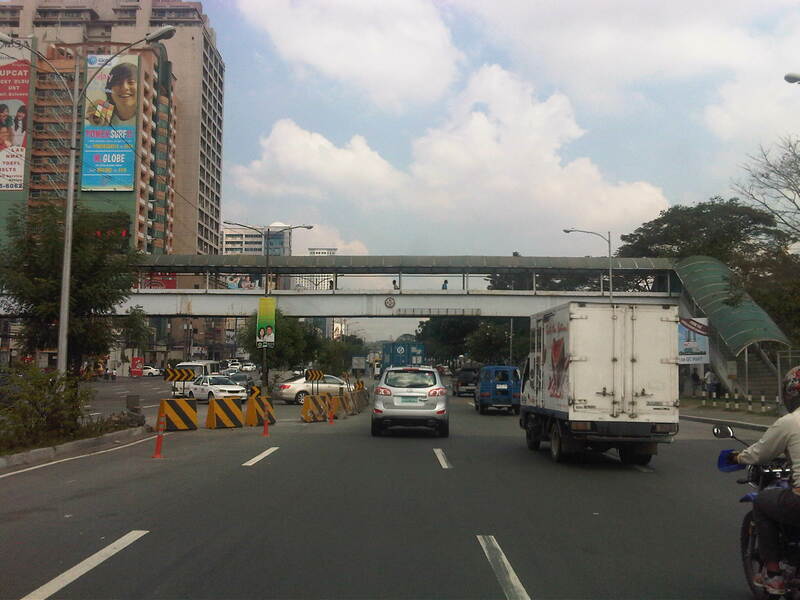 Typical concrete barriers near the foot of the Katipunan flyover across Aurora Boulevard – these are what will greet motorists speeding through the flyover and has been the bane of many who have crashed into these barriers (overspeeding? drunk? sleepy?). The barriers eat-up a significant portion of the middle lane and requiring drivers to swerve to the right and along the path of other vehicles. Plastic bollards have been installed but the concrete barriers remain and still pose dangers to motorists. Plastic bollards along Katipunan at the U-turn slot across from the Miriam College main gate – these are more forgiving in that it will cause damage to a vehicle but will not stop it on its tracks delivering potentially fatal injuries to occupants. A plastic jersey barrier can be seen at the end of the median island at the left side of the photo. Such were usually filled with water to increase their weights to avoid them from being displaced from their locations. There are other alternatives that may be installed and not just for U-turns, but also for public transport bays, medians and other applications. Some bollards may be collapsible, recovering (standing right up) after being bumped or ran over by a vehicle. Perhaps the MMDA should look into such options and other details more often while also proactively seeking for suitable, not necessarily novel, solutions to our traffic problems. By d0ctrine in Highway Engineering, Highways and Streets, Signs and markings on January 26, 2012 .